Erin Felber and Molly Hengst have both recently joined WBHS to head the athletic programs. Felber took on the role of West athletic director at the start of the school year, while Hengst began serving as East High’s interim athletic director in December. The two women have entered positions that are typically held by men in Wisconsin. 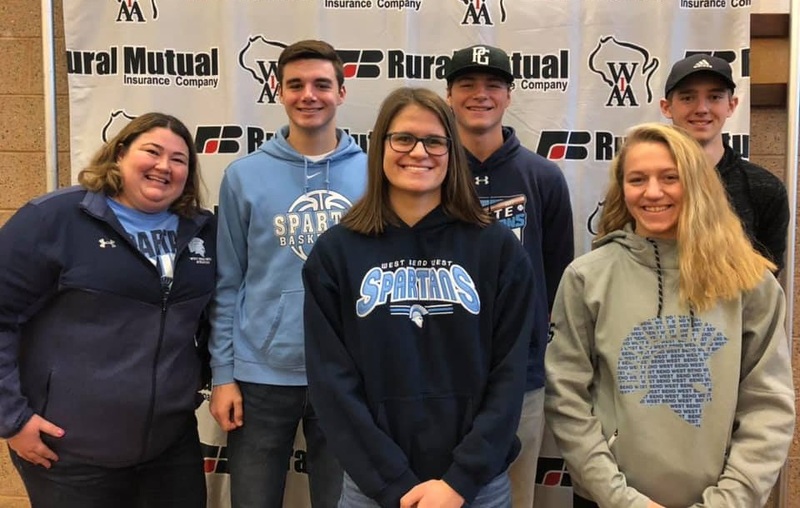 According to Todd Clark, the Wisconsin Interscholastic Athletic Association’s director of communications, only 66 of the state’s 511 athletic directors, about 13 percent, are female. When asked about her thoughts on being one of Wisconsin’s few female athletic directors, Felber explained that she wants to serve as a leader and role model for all students. Hengst also thinks she has an opportunity to show that gender does not matter in her position. “If equipped with the right skills, you can bring great experiences, growth and success to any athletic department, no matter if you are a male or female,” Hengst said. Hengst believes that because the field of sports has historically been seen as a male-dominated industry, women interested in the combination of education, athletics and management have rarely considered a career as an athletic director. “Females, however, hold the skills that would allow them to be successful, as they are typically classified as good communicators, problem solvers and organized, which are all skills that athletic directors need in order to be successful,” Hengst said. East interim athletic director Molly Hengst in her office at WBHS. East High plans to begin searching for a permanent athletic director in March. Photo courtesy of Hengst. Felber suspects that more men have traditionally become athletic directors because of the long hours that the role requires. Felber also thinks that as the years go on, more women will pursue careers as athletic directors. West principal Ralph Schlass says that during the process of replacing Brian Heimark, Felber’s predecessor, the criteria for the position had nothing to do with gender. Felber has previously worked as a physical education teacher and athletic director at Maple Dale School. For eight and a half years, she was also the head coach of the Alverno College tennis team. This is her first job as a high school athletic director. Since joining West High, she hosted the West Athletics Community Conversation Jan. 16 at WBHS. This event allowed community members to share their thoughts and ideas for the future of the athletic program. 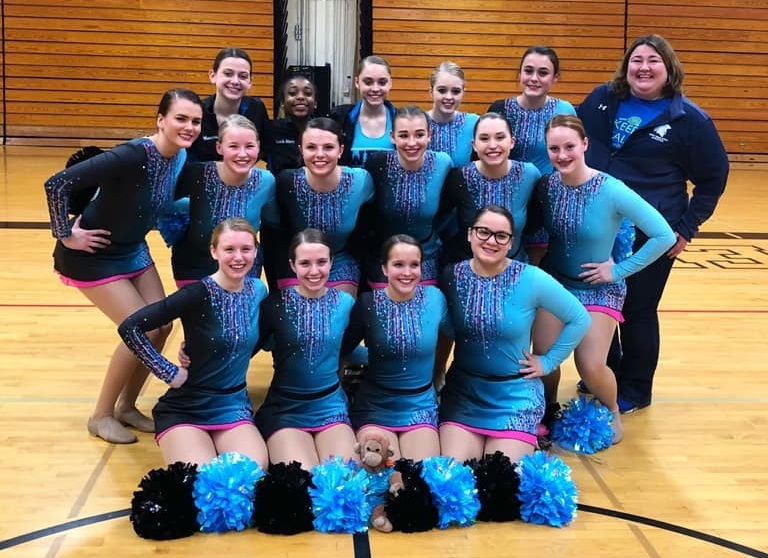 West athletic director Erin Felber (top right) poses with the West varsity dance team in the fieldhouse Jan. 19. Photo courtesy of Felber. West junior Macey Majewski, a member of the girls varsity swim and dive team, believes that having two female athletic directors is a positive change because it may bring more visibility to girls sports. However, East dance coach Kaylee Popp does not think that the gender of the new athletic directors will affect any WBHS programs. She also acknowledged that she has enjoyed Felber and Hengst’s services as athletic directors thus far. “They both seem like energetic and enthusiastic women and will be good role models in our schools,” Popp said. Before coming to East High, Hengst taught Spanish at Oostburg High School for 18 years. For 11 of those years, she gained experience as the school’s athletic director. Hengst also coached girls volleyball, soccer, basketball and softball. 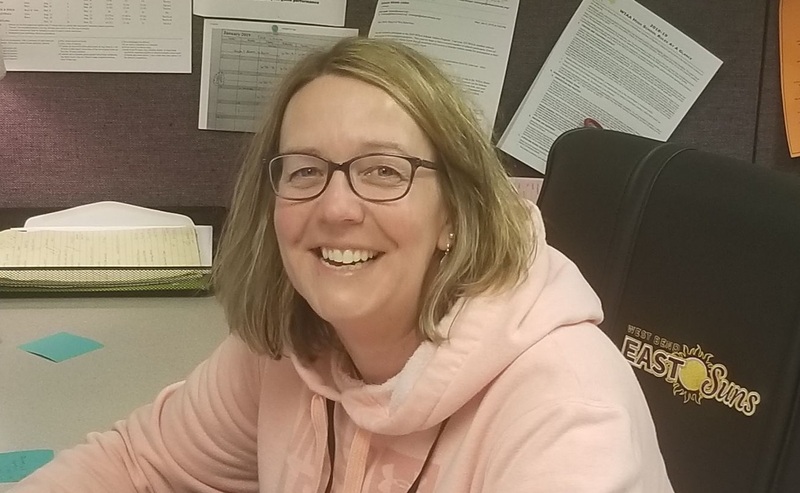 Because of her time as an athletic director in Oostburg, Hengst feels that she has been prepared for her new role at WBHS—but there’s a twist. Hengst encourages young athletes to embrace the competition and life lessons that interscholastic sports can teach. She also hopes that girls will take on future leadership roles in athletics.